What better way to get into the spring spirit then to stitch up a pretty floral wreath. 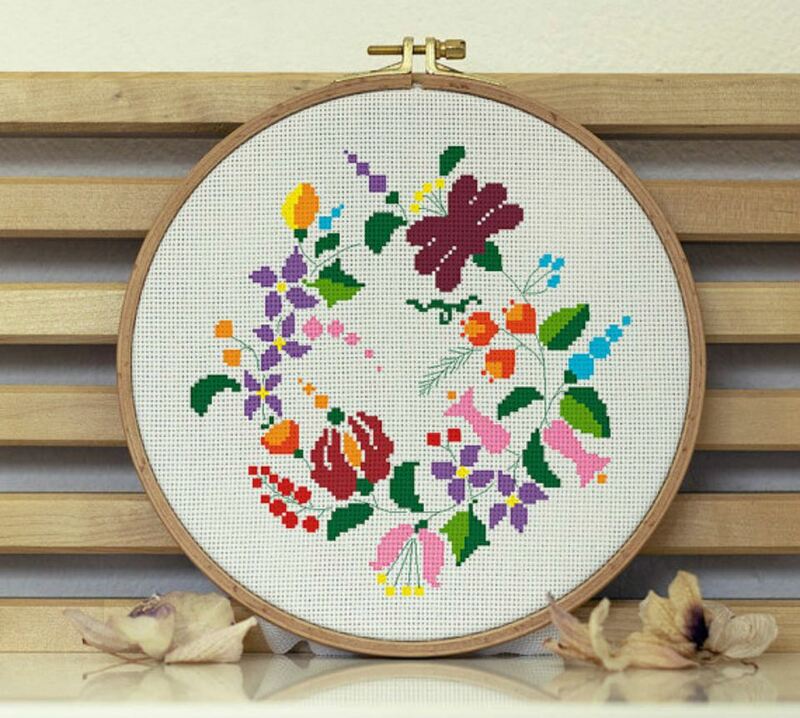 These 15 cross stitch patterns cover floral spring wreaths of all styles and skill sets. So what are you waiting for? Start stitching! First up: a bold and bright mid century wreath. This floral wreath showcases quirky colors and a little mid century modern flare. It is a great updated take on the floral wreath. Crossy Needle has this pattern and several other floral designs in their Etsy Shop. If the colors shown are not to your liking, you can always change them to fit your style and decor. Janlynn is well known for their traditional cross stitch patterns. This pattern of purple pansies is a freebie that they offer on their website. In addition to this pattern, they have several others, and various free projects for you to download. Most of the patterns are available in PDF form. Life is always good at the beach. The waves nipping at your toes, sand in your bathing suit, sun warming your bones. This cross stitch pattern mixes beach images along with a floral design for a sweet sampler that would look perfect in your beach house. You can find this pattern as well as other floral wreaths at ABC Stitch Therapy. This bright floral wreath can be downloaded for free. You can stitch it as is or add a quote or monogram in the middle of the pattern. The colors are perfect for spring but if they are too bright, you can always change them. Let your freak flag fly! You're weird! You're quirky! Be proud! This floral wreath with a fun quote is a perfect mix of traditional flowers with subversive statements. Stitchy Little Fox has several quotes with a floral design in their shop. Stitch up all of them for every aspect of your personality. Kirsten Schmidt shares many of her personal patterns on Flickr for free. This Peace Sign Floral Wreath is just one that you can download and stitch up. While these patterns are free for use, please be respectful of copyright issues and remember that it is for personal use only, not for sale. In a world gone crazy, and you need a reminder that Love is All You Need, Andwabsabi has this pattern as well as other floral wreaths in her Etsy Shop. This project would be wonderful for newlyweds or newly engaged couples. If you are looking for a quick and unique project then try your stitchy hand at this Beaded Floral Wreath by Mill Hill. This project is done on perforated paper and includes beading for added effect. You can create several of these wreaths to decorate your spring Easter tree. La La Craft Store has patterns and kits for every season and holiday. This Floral Wreath Kitcan be displayed all year long. The red berries are perfect for winter, spring and summer. This kit has everything you need to stitch and hang your project. Stickeule has so many free patterns on their website. These easter wreath projects are easy to stitch up and are perfect for both beginners and more advanced cross stitchers. Plastic Little Covers wants to make sure that you Take Care of yourself. This wreath and quote would be beautiful in an office or a home. It would also be great for someone starting out on their own. This pattern as well as subversive patterns are available at their Etsy store. Crafting for the Holidays has this free Lavender Wreath pattern for you to stitch up. It is a great project for beginners or for a make-and-take craft night. Use the pattern as a sachet for lavender. You can hang it in your closet, car or anywhere that needs a little pick-me-up. Gentle Feather offers their Floral Wreath for sale in their Etsy Shop. This wreath can be stitched as is or you can add a monogram or quote in the middle. You can also use this pattern to make scented sachets. DMC UK has so many free floral patterns. This wreath in the shape of a heart with tulips and butterflies is for the more advanced cross stitcher. You can stitch it on a pillow or in a hoop. It makes a great gift for a springtime wedding. Sometimes bigger is not always better. A perfect example of this is the Tiny Floral Wreath by Animal Cross Stitch. This pattern is stitched on a green fabric but you can use any color you wish to fit your decor.